Today I tried riding with split reins and realized how tattletale reins can really be! 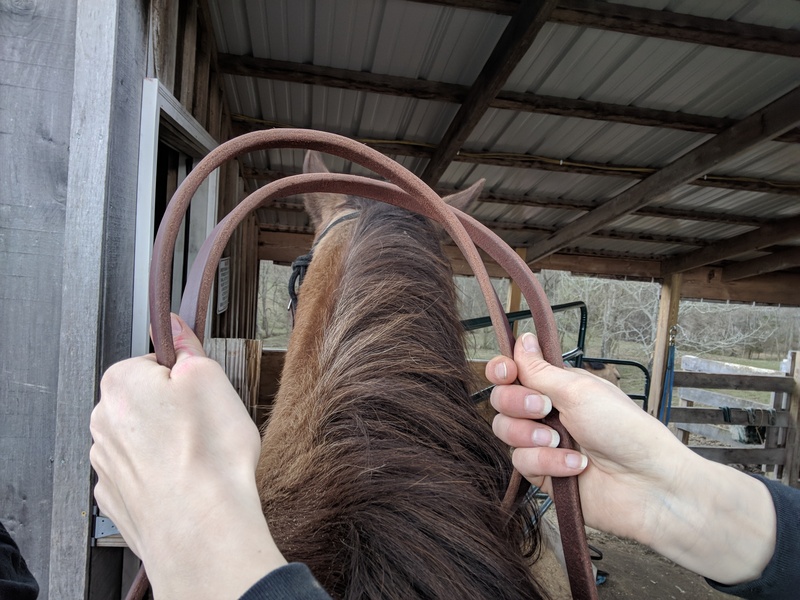 First off, let me encourage you to try some new riding way – if you’re english try western, if you’ve done a single loop rein try split (as I did). It made me feel like a beginner all over again and develop a lot of empathy for new riders! It also gave me a whole new awareness of my hands and reins skills, and realize that what I thought I had a good feel for was really just a habit in one particular way. Here’s a helpful tip: if you need help noticing how your riders are holding their hands, notice the angle at which the extra rein coming out the top is pointing. I was trying to think about using a similar visual that’s easier for the rider to see what their hands are doing – for example holding a brightly colored straw in each hand, with the goal being to keep the straws pointed up and parallel to each other. I think straws are bendy enough that they wouldn’t be considered unsafe, and thin enough they wouldn’t inhibit the rider’s use of their hands. You could even make the straws look like lollipops by adding a construction paper circle to the top, so the direction it’s pointing is more obvious. This would help when teaching things like indirect reins when the rider might twist their rein hand a little – many instructor say turn your pinkie in, instead you could say point your lollipop out. Which made me think of a straw game! Teach the skill of steering using correct hands – thumbs up and parallel. Give riders a straw for each hand to use as a visual, then practice steering with correct hands. For the game, give riders more straws so each hand holds 4 straws. Call out instructions to the riders that involve steering, such as reverse or steer through poles. When a rider’s hand tips the wrong way, they lose a straw from that hand. Call out, “Kate, Draw straw! Right hand!” And have them halt out of the way, draw a straw from the offending hand, and hand it to their volunteer – this conveniently also works on fine motor skills. The rider with the most straws left wins. Do you have any other good visuals for keeping good hands?